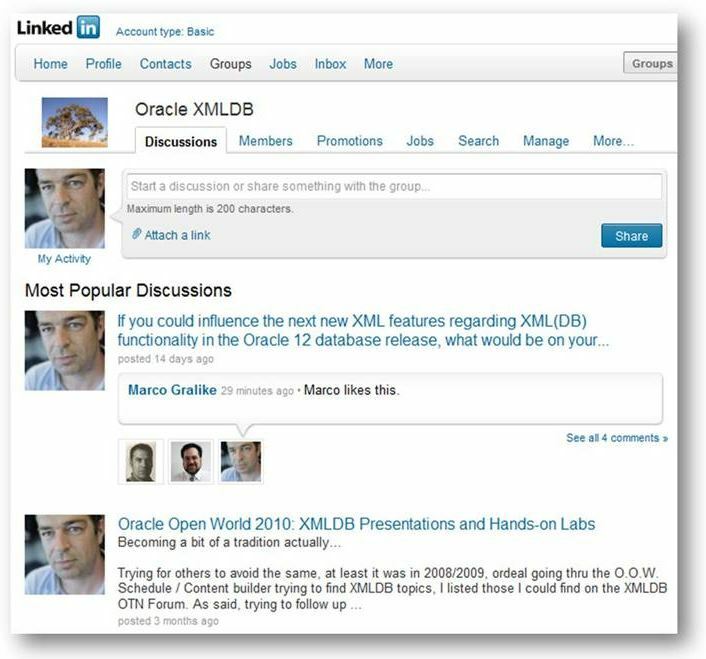 I started a Oracle XMLDB LinkedIn group to provide via this media some more high level discussions or ways to share info. If you are interested, join. This LinkedIn group will be updated and managed by me until Oracle starts an official Oracle XMLDB LinkedIn group. I have noticed that LinkedIn Groups discussions of other vendors or interest groups can be very insightful of what actually moves people in the market. If you could influence the next new XML features regarding XML(DB) functionality in the Oracle 12 database release, what would be on your wish list? What do you think should the Oracle XMLDB Developers Guide be split up in an “XMLDB Developer” guide and an “XMLDB Administration” guide or “XMLDB Concepts” guide? Join us via the Oracle XMLDB LinkedIn here.